Keiron, a young skunk Gelert, was peacefully sleeping in his bed until his sister Lilac called for him. 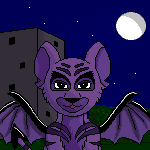 Lilac was a purple Ogrin. Keiron groaned and slowly stood up. He stretched, then trotted out of the room and into the kitchen. Sure enough, Lilac was there, sitting in the middle of the room. Keiron sighed. He entered the living room. It was just like he’d expected it to look. His other sister Sara was clinging to the chandelier and a tiny Spyder was perched on the floor. “Oh, Sara, not again...” Keiron shook his head, ashamed. Sara was an Ice Aisha, and she had an extreme fear of Spyders. Lilac scooped up the little Petpet and shooed it out the door. “Oh, Sara... you’re going to have to get over this issue!” Lilac scolded. “I swear it was going to bite me!” Sara pleaded. Sara’s eyes grew very wide. “S-Spyders are attacking me w-when I sleep? !” she sputtered. Lilac shot Keiron a glare, and Keiron decided to shut his mouth. A few hours later Keiron was sitting on the floor in the hallway, playing with his Petpet. The little Spardel stared at Keiron hopefully. “Do you want the ball, Ryan?” he asked his Petpet while dangling a red ball over his face. Ryan the Spardel still stared. Keiron threw the ball across the hallway. Ryan ran after it, tripping over his paws on the way. Keiron couldn’t help but laugh. When the little Spardel returned with the ball in his mouth, Keiron took the ball. Lilac’s voice echoed through the air. “Yeah, Lilac, I’m right here,” the Gelert answered. “Okay.” Keiron dropped the ball on the floor. Ryan followed the Gelert into the living room. The Ogrin was sitting on the couch, looking as if she was expecting Keiron (which she was). Keiron had a seat on the couch, and Ryan took a seat on the rug. Even though Lilac had her doubts, she followed through with Keiron’s plan. She made a Spyder plushie in just 10 minutes, and Keiron thought it looked adorable. It only had two eyes, and it was made out of pink material (Pink was Sara’s favourite colour). Its legs were made out of fluffy material, and it had no mouth sewn on. With the Spyder plushie, Keiron made his way over to Sara’s room. But he was quite surprised when he got to the doorway. Sure enough, there was asparagus and socks scattered all across the floor in Sara’s bedroom. The Aisha was curled up on her bed. “You see, when the Spyders try to come into my room, they will eat the asparagus instead of me. As for the socks, well, I don’t really know,” she said. The Gelert didn’t have the heart to tell her that Spyders can climb across the ceiling. That’s when Sara noticed the Spyder plushie in Keiron’s paws. She let out a squeal. Keiron turned and left the room. Unfortunately, Sara didn’t know that Plushie Spyders were orange. Later that evening, Keiron was sitting on the living room couch again. Lilac was frustrated and pacing the floor. Ryan was happily chewing on the Spyder plushie. It took Lilac almost half an hour for her to explain to Keiron that his plan was foolish. That’s when there was a knock at the door. Lilac answered the door. It was Mina, the lovely Rainbow Usul who lived next door. Lilac lead Mina to the kitchen and Keiron followed. Ryan didn’t bother to follow. He was too busy chewing on the plushie. Once everyone was seated at the table, Lilac took a steaming kettle from the stove and poured some tea into three mugs. She gave everyone their mug and sat at the table. “So, what would you like to discuss today, Lilac?” Mina inquired. Lilac smacked herself in the forehead. “Of course!” she groaned. “Why didn’t I think of it before?” And with that, she stood up, pushed in her chair, and ran out the door with her purse. Mina beamed. Keiron was not quite sure what had happened until Ryan walked into the room with the Spyder plushie in his mouth. The next morning, after Mina had went home, Lilac had acquired a Spyder Juice Elixir from the pharmacy. She walked into Sara’s room with the potion. Sara had not eaten nor slept since Mina’s visit. This was really getting serious. “Hey, Sara? How are you feeling?” Lilac asked. “Oh, Lilac, I would feel so much better if Spyders weren’t out to get me,” the Aisha responded. “How would you like to not be afraid of Spyders anymore?” Lilac held up the Elixir. Lilac thought, This could be tougher than I thought. An hour later, Keiron came up to Sara’s room with a nice frosty glass of lemonade. Sara had lain down on the bed, her eyelids closed. She was asleep. “Sara, you really need something to drink. How about some lemonade?” the Gelert whispered slyly to himself. He placed the glass on her desk. Sara had joined Keiron and Lilac at the table in the kitchen for lunch. The Ogrin was serving a Roast Chestnut Pizza. Everyone grabbed a slice and began eating. “Sara, what do you think of when I say ‘Spyder’?” Keiron asked. Lilac and Keiron exchanged happy glances. "I don't like pink. Pink is not my kind of color. I am not putting this on market until you get rid of the pink..."
That's Valentines, Mrs. Uppington, and it's a day where Neopians everywhere celebrate friendship. Surely, you have heard of it? Luther didn't look offended at all. "Oh, I'm not even paying. It was Griptor's gift to me, for services to the hotel. Two weeks in Terror Mountain! A warm suite in the Mountain Lodge!"